As chance would have it, in the weeks leading up to my Colorado River canoe trip, I managed to hitch onto another canoe trip. This one was a little more “extreme”. 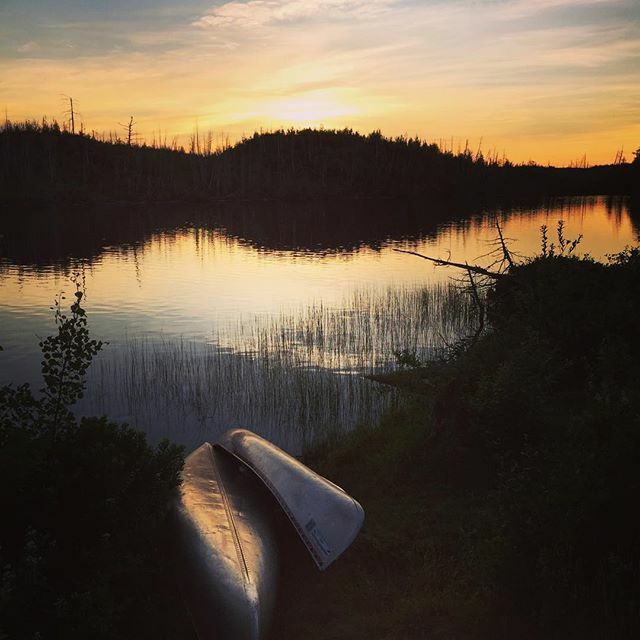 A group of us were going to Minnesota for a friend’s wedding, and so the plan was to get there early, drive up to the Minnesota Boundary Waters, and head out into them on canoes for a 4 day/3 night adventure. Apart from this being the first time I’d flown into a different state to go camping, I’d also be going with 4 people I’d never camped with, and canoeing into very, very remote wilderness, where we had to portage our canoe between lakes, and were beyond the reach of motorized vehicles of any kind (let alone cell phone reception). Almost everyone else’s flights into MSP were delayed, which actually worked out OK, because it meant we all ended up landing at similar times (otherwise I would have landed a few hours later). We grabbed our rental car, loaded everything in (whoah, 5 people + gear in a single SUV! ), and drove up to Grand Marais. Lake Superior is pretty incredible. The largest fresh-water lake on the planet, and apparently holds about 10% of the Earth’s fresh water! That night we camped in Cascade River State Park, which is just outside Grand Marais (technically in Lutsen). We got rained on a bit overnight and into the morning. Drove into the Boundary Waters and got to our put-in point, Seagull Outfitters. After chatting with the folks there, we decided to try to get to Lake Ogishkemuncie (aka “Ogish”). We put in at Seagull Lake, and got turned around a bit in amongst all the small islands, so that instead of going along the North shore of Seagull Lake as planned, we got South of Three Mile island, and effectively tracked the South shore of Seagull. Oops — mostly my bad. The hardest thing about navigating was getting a feel for scale and distance. Once we realized what we’d done, we got on track, and had a better sense for the scale of things IRL vs the map. Our first portage was actually the longest one we’d have to do the entire trip, from Seagull into Alpine. It’s roughly 100 rods (portages are measured in “rods”, which are approximately equal to the length of a canoe). It was pretty flat, but there were some ugly muddy patches which made it a bit tricky. It’s also just rough carrying a canoe on your shoulders for any real distance. I think if I did it again, I’d go for a lighter weight kevlar canoe, even though you need to be a bit more careful with them. Not too long after that we had another portage into Jasper. Since we were pretty tired at that point, and didn’t really want to attempt another two portages to get to Ogish, we decided to base camp at one of the campsites suggested by the folks at Seagull, on Jasper lake. That turned out to be a great decision — awesome campsite, so we stayed there 2 nights. The next morning we got a little more rain, but nothing too serious. On Wednesday we decided to day-trip over to Ogish and finish what we started. We realized it would have been a really long day if we’d tried to get all the way there on the first day, especially having to portage all our gear. Since we were base-camped, our portages were much lighter/easier this time. In the afternoon, Brandon and I tried our hand at fishing. My Tenkara rod didn’t yield anything, but he caught a smallmouth bass on his spinning rig (in addition to hooking himself pretty deep on the thumb!). We kept the fish and ate it that night. I also managed to pick up a bunch of leeches on my feet, I think perhaps while I was fishing and standing in the shallows. I thought I remembered that you’re supposed to burn off, so I used a lighter and did that (Note: you’re not). We slept at our basecamp again, and saw a little bit of the Northern Lights (green haze, some streaking). We also stayed up and checked out some amazing skies/stars, including a huge, clear view of the Milky Way. We needed to be able to get out of the Boundary Waters, and back to the Twin Cities relatively early on Friday, so we paddled back to Seagull and went looking for a good spot to camp there for the night. Our requirements were in Seagull Lake, past a certain point (closer to our take-out point), and on an island. After going past about 5 of our shortlisted spots and finding them all taken, we started getting a bit stressed out, but ended up finding a really fantastic spot on an island just off the south-west tip of Three Mile Island (which is itself within Seagull Lake). Along the way, we foraged for blueberries and raspberries while portaging, and had a delicious healthy snack. I managed to get more leeches. My guess is that they were actually camping out in my sandals, and that when I put them back on in the morning, they all just jumped on. Either that, or I’m just really unlucky. In the afternoon, after setting up camp, Brandon and I went out with his spinning rod and each caught a fish! We had them both that night as well, combining three of my “bucket-list” items — going on a multi-day canoe camping trip, camping on and island on a lake, and cooking a fish that I caught over an open fire. This night we were treated to another absolutely amazing sunset, and then the real spectacle — serious Northern Lights. We had all sorts of green glowing, streaks, flashes and swirls. It was absolutely stunning (even though I know it wasn’t remotely as intense as it gets sometimes). Up early (about 6am) and pack everything up quickly so we could get on the water. There was some mist floating around when we set off which was pretty dramatic. We paddled out within a few hours, got back to Seagull Outfitters and unloaded everything. They have a shower-block, so we cleaned up a bit and loaded everything back into the SUV so that we could make the drive back down to the Twin Cities in time for a pre-wedding pool party! This was definitely one of the most memorable trips I’ve been on, and I don’t think I’ll ever forget it. The Boundary Waters are a truly special place, and I hope we can maintain and protect them for years to come. I’d love to return for another trip there, and would hope that things were exactly the same as I left them.